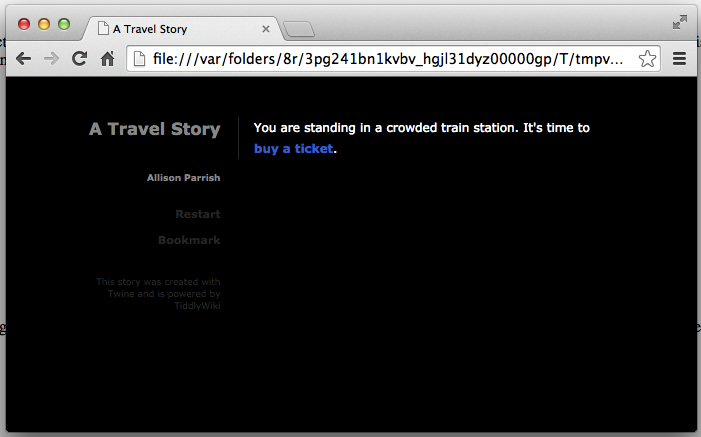 Download Twine here. 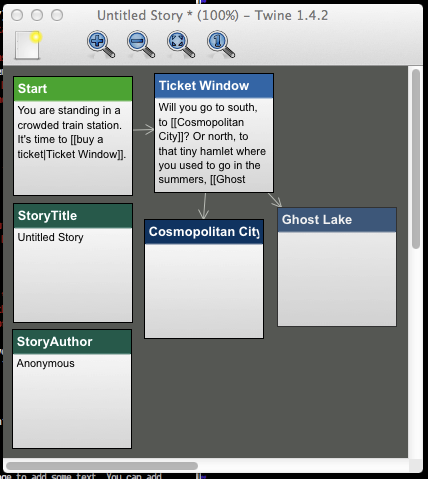 This tutorial is about Twine 1.4. 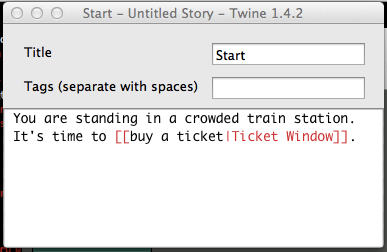 Twine 2.0 is great, but it's still in beta! 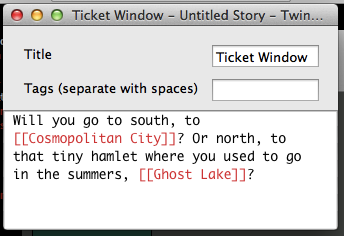 A Twine game is made from "nodes" (or "passages"; in fancy hypertext terms, we'd call these "lexia") and links between them. The application's interface represents each node as a box, and links between nodes as arrows from one box to another. This is helpful for understanding and keeping track of the structure of your game. The weird text in the [[ and ]] is a link. The text to the left of the pipe character (|) is the text of the link, and the text to the right of the pipe character is the name of the passage you want to link to. Now go back and add some text for the new links you created. 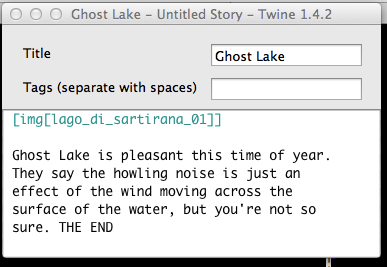 You can also start the game from an arbitrary passage by ctrl+clicking (or right-clicking) on the passage in the Twine editor and selecting "Test Play from Here." 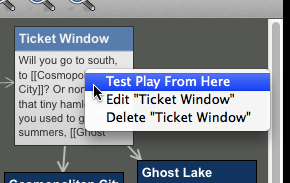 This is helpful when you want to test just a small part of your game and not the whole thing. 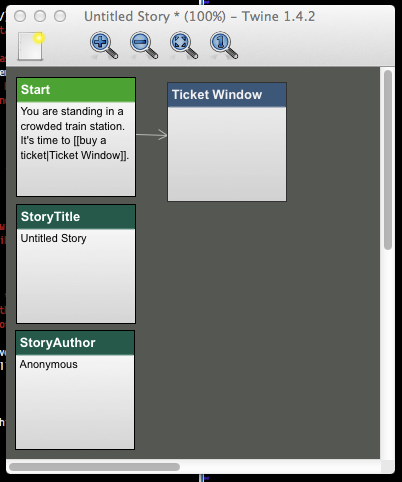 The file you create when you "Save" is a .tws file, which is a kind of file that Twine needs to store all the information in your game, along with information like the position of the nodes in the GUI. 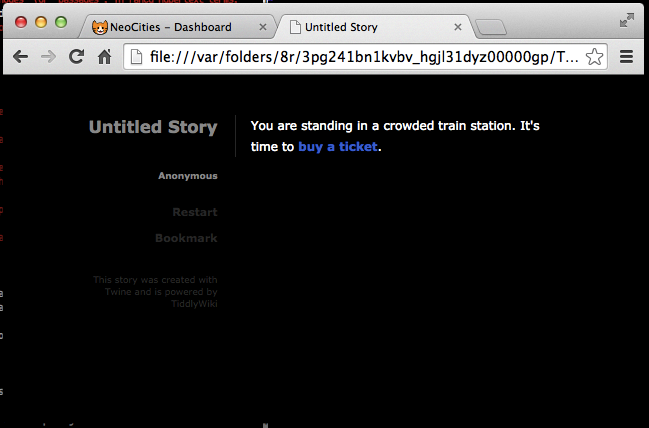 If you want to share your game with other people, you need to "build" it as HTML. 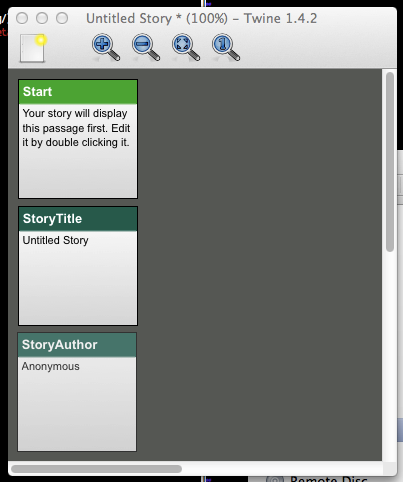 Do this with Build > Build Story... This step will create an actual HTML file. You can upload this file wherever you want (including your Neocities account), and anyone with a web browser can play it! If you change an image's name, though, you'll have to go back and fix all of the passages where you embedded the image. 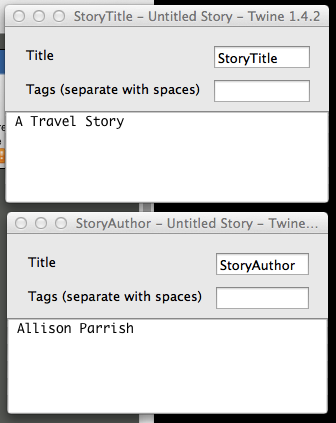 Twine has its own "markup" language, similar to MediaWiki's markup language. 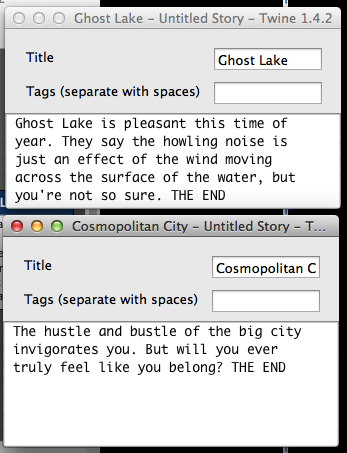 You can include HTML in your Twine passages. FIXME You can review the markup language here.